Lotus has announced that it is to create more than 100 new jobs, including a new intake to its revamped graduate programme. The firm will recruit 45 specialist engineers and 40 manufacturing operatives, along with 18 graduates. investment by owners DRB-HICOM, enabling the company to strengthen its engineering, productivity, efficiency and quality. Both the engineering specialists and graduates will work on the development of new products within Lotus Engineering, one of the most renowned automotive engineering facilities in the world. Lotus has created the new positions in response to increased global demand for its sports cars and an anticipated rise in interest in its engineering consultancy services. The firm is also focusing on growing into new global markets as currently around 90 per cent of all Lotus vehicles are exported. 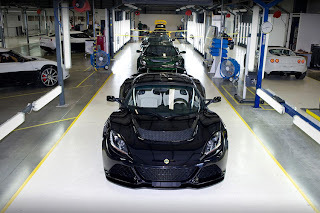 Lotus, which recently unveiled its latest model, the Exige S Roadster, employs more than 1,100 staff across the UK with its headquarters based in Hethel, Norfolk. "Lotus' successes have always been built on our talented and dedicated workforce and as we embark on a period of strengthening, it's crucial that we grow our workforce to support this," said Mark Pym, Group Head of Human Resources at Lotus. "It's a positive sign for both the UK car industry and Lotus that we are able to recruit such a high number of both experienced specialists and graduates, who will take their first steps on an exciting and rewarding career path." "It's been a period of substantial change at Lotus and we are now in a strong position to expand our work on future products and to increase production in our manufacturing facilities. We want Lotus to be at the forefront of the global automotive industry and for us to remain competitive, we will introduce more exciting products - there has never been a better time to be part of the future of Lotus," said Aslam Farikullah, Chief Operating Officer at Lotus. Lotus is accepting applications now. For more information and to apply visit www.lotuscars.com. All applications will only be accepted through the website and will not accept speculative CVs.